Adventures in the Endless Pursuit of Entertainment: Today: Der Rosenkvalier, Live in HD from the Met! 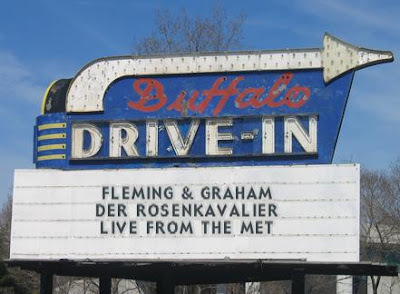 Today: Der Rosenkvalier, Live in HD from the Met! If you're not taking advantage of seeing live broadcasts of operas from the Metropolitan Opera, whether your'e in New York City or Timbuktu, you're missing out on all kinds of fun! Besides a grand seat with close- up views of beautiful singers, better than any high powered binocs could deliver, there are intermission features including interviews with the stars and how-they-do-it demonstrations from the stagehands to the costumers. Plus, there's popcorn (if you're into such a vile snack). Somebody needs to buy the folks at the Buffalo Drive-In one more "A"!